Today we’re handing the blog over to Jerry Banfield. Jerry is an entrepreneur and teacher who has coached over 80,000 students on everything from Facebook marketing through to time management and productivity. Last year Jerry built and sold a profitable site on Flippa for $5,500 with no experience and the best part is, he’s put together a step-by-step Udemy Course to share the details on exactly how he did it. Usually $199 – for a limited time, Jerry has dropped the price down to just $25 for all Flippa users. Simply use coupon code: FLIPPABLOG or THIS LINK. When I went to relist my website again, I realized it was crazy to do the same thing I did before and expect different results. For the next few weeks prior to launching another listing, I researched the Flippa marketplace to see what websites were already selling so that I could discover what they all had in common. I found websites that had sold for at least a thousand dollars almost always showed solid proof of income and had verified Google analytics. I also discovered what price to start the bidding at, how to write a compelling listing to attract watchers, how to directly contact potential buyers, how to convert people watching to bids, why every question was worth answering in great detail, and what I needed to do to make it easy to close the auction successfully. When I used what I learned to launch a new listing on Flippa, the same website that did not attract even one bid when I listed it before sold for $5,500. 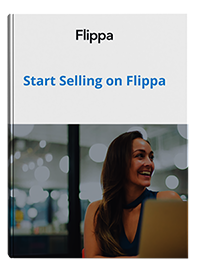 You can skip the painful learning process I went through to learn how to sell on Flippa when you take this course. You can see what your website is really worth when you list it the way I listed mine. This course will continue to be useful for you through any improvements Flippa makes because what I teach is based on principles that you can adapt to what you are doing today. You can count on me to answer any questions you have in the course and to add new lectures based on your feedback! Thank you for reading this and I appreciate the chance to serve you as your instructor in this course. Learn how to build & sell a profitable website on Flippa today for just $199 $25!